This app puts green screen photography special photo effects at your fingertips! 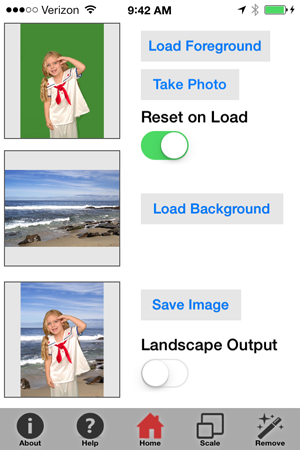 It can use any green screen photo on the camera roll or it can make use of the iPhone/iPad built in camera to create green screened images that can be saved, emailed or sent to Facebook. It can be used to explain to customers how the green screen process works or as a fun toy to make stunning photos for your family and friends. This app uses the same powerful green screen algorithm found in the desktop version of Green Screen Wizard software used by over 20,000 photographers and photo hobbyists. Get started now having fun with your kids or be the life of the party! All you need it this app and a green backdrop (you can use green paper or purchase a green screen). As of app version 2.0 there is a built in erase/restore editor to fix problem areas in your photo. Take me to Green Screen Wizard Mobile help files.. The app is sold in the app store for only $4.99 . You can find it by searching for Green Screen Wizard or you can click on the link below.